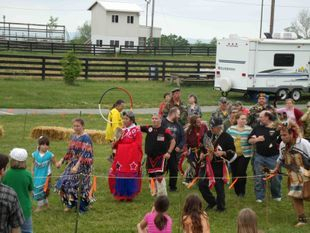 Last year was an exciting year for the community and our Center. 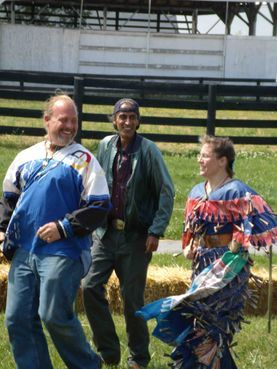 When Chuck passed this Center to us, he wanted to see these traditions and ways keep moving forward to the next generation. 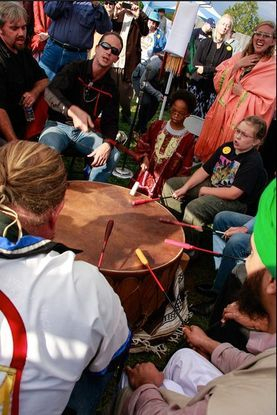 Through lectures, documentary screenings, community events and collaboration with other communities we keep this vision and memory alive. If you want to stay up do date on what's happening this year, click here. 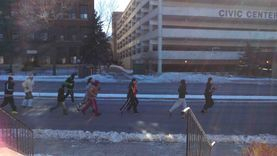 This year we rang in the New Year with the 25th annual On the Red Road Sobriety Pow Wow in Minneapolis. 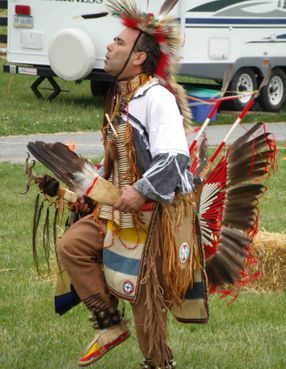 Lasting three nights, this powwow provides a place for the community to come and celebrate in a safe place. 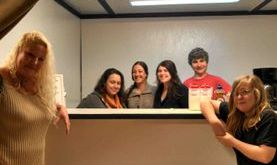 We were able to assist with the registration, organization and the Celebration of Sobriety Countdown to the New Year. 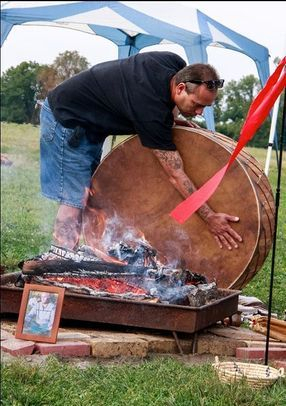 Many of you have heard of the grassroots Idle No More movement from Canada, which is spreading like wildfire across the country and in the news. 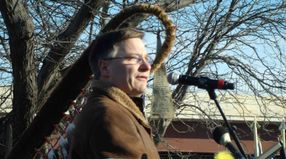 Idle No More is standing up for Canadian First Nations Treaty Rights in the face of government efforts to change and eliminate treaty rights. 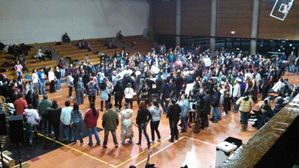 At a Flash Round Dance rally in Minnesota on Christmas Eve, Clyde Bellecourt was arrested for simply watching the dancing. 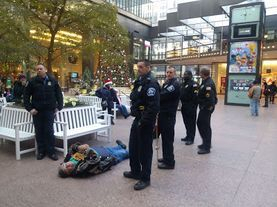 We were able to assist Clyde at this time, working with AIM Twin Cities to spread the word about the situation, manage Press Releases, and see that Clyde was released before court shut down for the holiday. 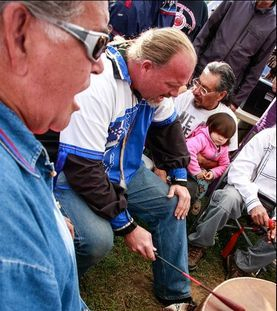 See the coverage in Indian Country Today here. 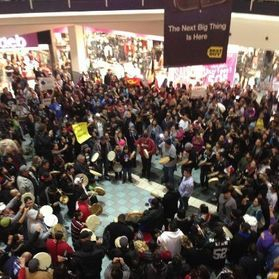 We also spread the word about another Flash Round Dance at the Mall of America and attended the rally of several hundred. 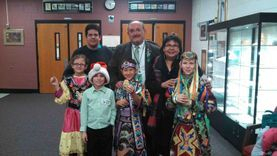 Originally our December trip out west was to support the efforts of the Dakota 38 Memorial Ride, but our focus quickly expanded as we arrived just in time to be asked to help with logistics for a special delegation to the Newtown CT & the Sandy Hook Elementary Communities. 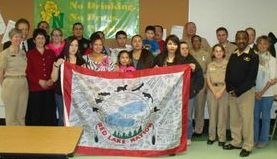 In 2005 Red Lake Reservation in Northern MN suffered a school shooting which left 10 dead. 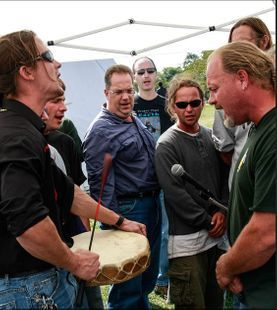 Survivors of the Columbine High School shooting quickly travelled to Red Lake to offer comfort, share their own story, and participate in the healing ceremonies for the community. 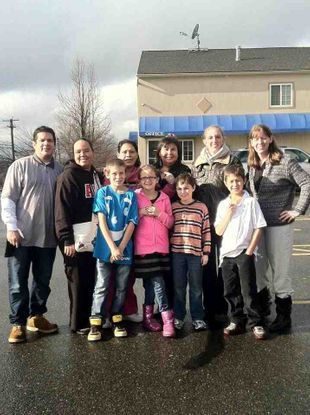 Wanting to bring this same measure of comfort and hope to Newton, Red Lake survivors travelled cross-country to CT to meet with the families and communities. It was an honor to represent our community and travel to CT. 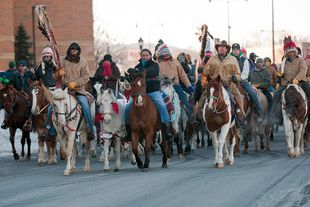 This year’s Dakota 38 ride celebrated the 150th anniversary of the Dakota War of 1862 and the hanging. 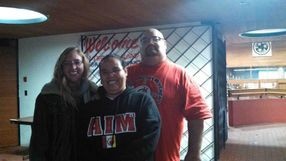 We were able to meet with Darwin, the MN coordinator for the Ride and will be organizing continuing support for the community and this year’s upcoming Ride. 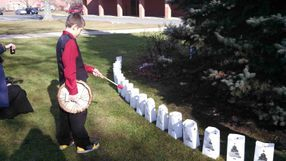 We also shared in ceremony with the Dakota 38 Run. Thank you to all of you who supported our screening this year and the Ride, your help is greatly appreciated by the community. 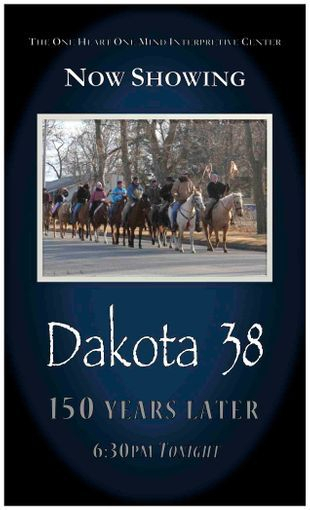 For our December 2012 Documentary Screening the Center showed Dakota 38, the emotional documentary which follows the progress of the first year of the Dakota 38 Memorial Ride. 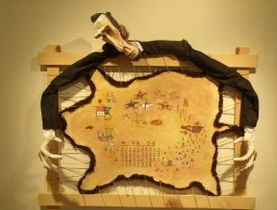 The event that sparked this ride is the 1862 hanging of 38 Dakota men after the Dakota Uprising in 1862. 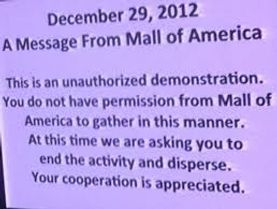 It is the largest mass hanging in the history of the US. 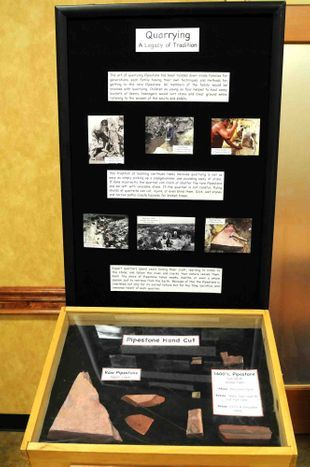 The hanging sparked years of racial violence, murder, and genocide. 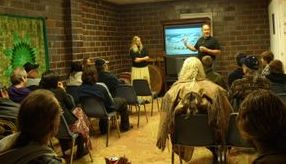 The Screening was well attended and the proceeds from our Indian Taco Sale went to help this year's Riders and coordinators. Thank you! 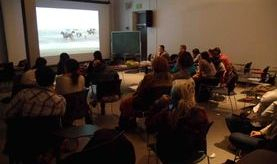 We also showed Dakota 38 at Maryland Institute College of the Arts (MICA) in Baltimore, MD. 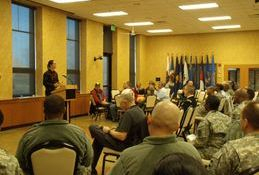 Jennifer Hudson presented the documentary and spoke about the hanging and the consequences that still affect us today. 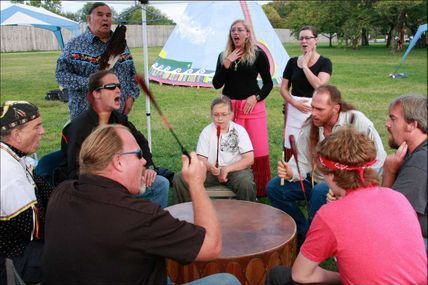 Lakota culture, ceremonies and language are intertwined and cannot be separated. Each section individually, without the others, is incomplete. 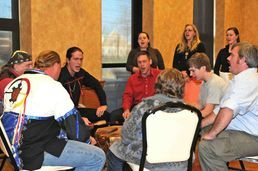 Participants in this class learned about the language of Songs and the difference between literal and spiritual meanings. In November we took a look at the man that history books will never tell you about: the Real Abe Lincoln. Was Lincoin the savior of the Union? Or was he a racist and fascist who worked to destroy minorities in this country? Those who attended decided if Lincoln was the man they thought. 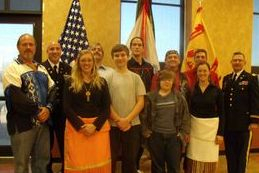 In November we joined the Fort Detrick military base for their annual honoring of the National American Indian Heritage Month. 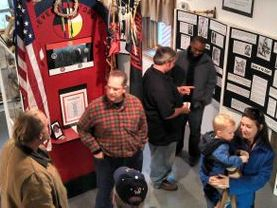 Guests were treated to the Center's travelling displays, the Tunsweca H'oka (Dragonfly Singers), and remarks by Michael McGee. 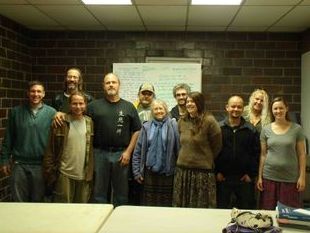 This November, the Center was asked to assist with the Prayer Vigil for the Earth. 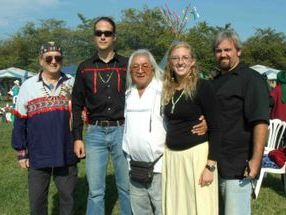 This year marked the 20th anniversary and most likely, the last Vigil in Washington DC. 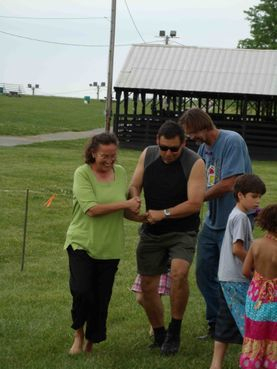 It was an honor to bring our tipis, set up crews and of course, the Tunsweca H'oka. 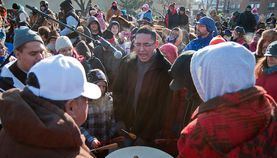 The Vigil was well attended and we were honored to be joined by Howard Bad Hand and Clyde Bellecourt. 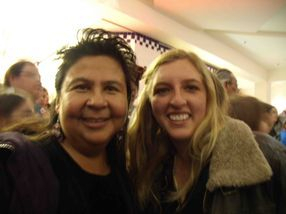 This May we attended the Democratic National Black Caucus with Clyde Bellecourt for a summit in Washington, DC on voting rights and the challenges facing minority populations. 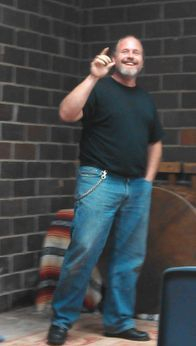 After the summit, Clyde joined us at the Center for dinner and a lecture.